It’s no secret that today’s business graduates have remarkable academic skills and technical acumen—but for reasons ranging from being born in the Internet age to coming from cultures with different social norms, many lack the communication and networking skills that are vital to securing their future careers. That’s why Simon Fraser University’s Beedie School of Business conducts interactive workshops, tutorials, and other activities designed to help their graduates confidently navigate any social situation that might lead to a job interview and employment or prepare them to become leaders within their current organization. Fostering networking skills is prevalent in campuses of higher learning across Canada with 89 per cent of post-secondary institutions offering networking workshops according to a 2016 survey by Sjolander. Volunteers from regional business communities are heavily relied upon to support the cause (in Beedie’s case, up to 500 volunteers from the Greater Vancouver business sector offer their services yearly). This is followed in their final years with more extensive networking opportunities and job fairs, by which time the students are already well on their way from making the transition from academe toward the real working world. 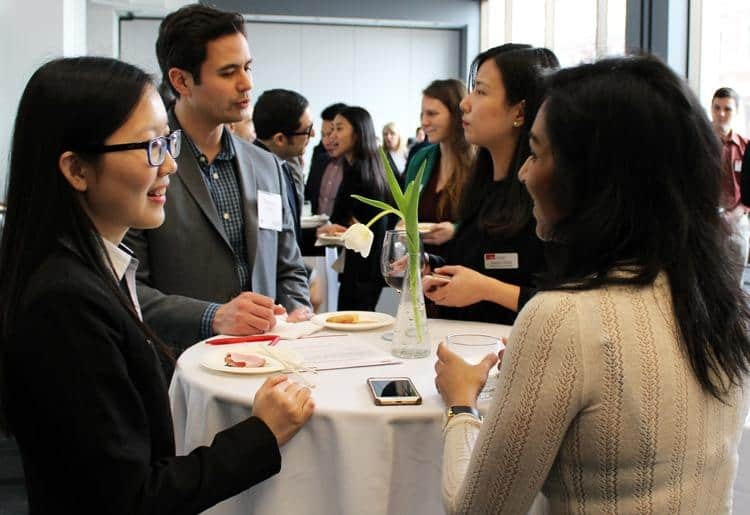 Beedie’s networking strategies begin at the graduate level with a leadership class in which full-time MBAs interview business leaders in their work setting. “At this stage they are interacting with CEOs and developing the confidence necessary to meaningfully and effectively pursue networking opportunities,” says Sjolander. A few key statistics suggest that Beedie’s efforts are paying off: 97 per cent of students of the institution’s full-time MBA program find employment within three months of graduation; and for students already employed, many experience a 25-per-cent salary increase by completion of their studies.